Three new Kindle Fires to light up 2013? Amazon's Kindle Fire line is set for a 2013 refresh, and quite a significant one if there's any truth to the latest information leak. The company is said to be readying at least three new Kindle Fire tablets, which will launch before the Christmas shopping season kicks off. 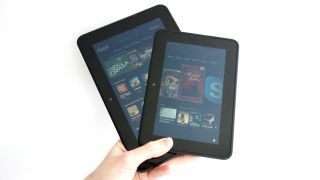 The first tablet will be the successor to the 7-inch Kindle Fire, which is said to arrive with a sharper 1280x800 resolution, the same as that found on the Kindle Fire HD. The HD will of course also be getting a newer model, which will apparently be making a significant jump to a 1920 x 1200 resolution display. Compare that with the current 1280 x 800 display and it's fair to say that the leap is substantial. As for the Kindle Fire HD 8.9, the resolution will be bumped up from 192 x 1200 to 2560 x 1600, putting it up against the high-res displays of the iPad and Nexus 10. The design of the tablets is also said to be getting an update, with the slates set to get a more angular look than current batch. The corners won't be as rounded and the look has even been described as "chiseled". The power buttons are also said to have been moved from the tablet side and onto the rear of the slate, though at an angle that avoids them being pressed when the Kindle is placed on a flat surface. Finally, sources claim the tablets will be a fair bit lighter than the current models. Of course, as ever, we recommend you take all this with a pinch of salt. With Barnes & Noble now out of the ereader game, Amazon has one less competitor to worry about as it keeps up the pace behind the iPad. Could this be the year that the Kindle Fire really lights up Amazon's place in the tablet game?